Overview: Rodney Craig, executive director of the Michigan Statewide Independent Living Council, talks with reporter Peg McNichol about the Feb. 10 Listening Tour at Loutit District Library in Grand Haven. Peg McNichol: You are Rodney Craig, executive director of the Michigan Statewide Independent Living Council. What is the Michigan Statewide Independent Living Council? Rodney Craig: Okay. The Michigan Statewide Independent Living Council is a governors appointed council and it is made up of 15 individuals who are primarily tasked with writing and evaluating the state plan for independent living. Each state in the nation has a similar arrangement of individuals; and in Michigan we have the 15 people that represent the council. Peg McNichol: Who are your 15 representatives? Not by name, but basically what areas do they cover? Rodney Craig: Our 15 representatives cover various areas of the state. So they represent various geographical areas of the state, as well as urban or rural areas. In regarding their disability types they are what we consider cross disability individuals. So we have a wide variety of membership. Which would include people with visual impairments, and there are all sorts of disabilities. Independent living is a construct of all those cross disability individuals. Peg McNichol: Tell me about this listening tour that you’re having. I know there’s a stop in Grand Haven coming up on February 10th. How big is this West Michigan Listening Tour and what are you hoping to hear? Rodney Craig: What we’re hoping … right now we’re hoping is the room is set for about 100 to 150 people. What we are is gathering information for our State Plan for Independent Living. And one of those things is looking at the independent living philosophy, which we feel that people with disabilities are the best experts on their own needs and are deserving of equal opportunity to decide how to live, work and interact in their own communities. So it’s with that philosophy and thought process that we’re having that event because we want to hear from the community as to what type of input that they have, what type of barriers that they have to independent living in their communities. Just what they would like to tell us to go into that State Plan for Independent Living that our council is charged with writing and evaluating. Peg McNichol: So this is at the Loutit District Library in Grand Haven, are you making other stops throughout West Michigan and if so where would those be? Rodney Craig: Currently, we are scheduled to have this one stop in West Michigan and then we’re kind of working more towards the Grand Rapids area and coming east across the state. We’ve had one event in Traverse City already as well. We’re also doing these events in collaboration with our Centers for Independent Living. The event in Grand Haven is in collaboration with Disability Network Lakeshore from Holland, and Disability Network West Michigan in Muskegon. Peg McNichol: And I take it those organizations will do things like they’ll help people get to the library because I would imagine - I know this to be true actually - that for many people with disabilities transportation is a huge barrier for independent living. Rodney Craig: Yes, very much, and that’s some of the information and feedback that we’re already getting. The centers are assisting with some transportation, and transportation information for individuals, to make it as well to the event. Again more information that we’d like to hear from people; what do they they experience with transportation and what sort of barriers do they face in their community with that as well. Peg McNichol: How long has the State of Michigan had an Independent Living Plan? Is this the first one, or is this an update to an existing plan? Rodney Craig: Each year. We’ve had several State Plans for Independent Living. They run for about a three year period. So right now we’re in the third year of our current plan. Every three years we evaluate the plan, and write a new one. So we’ve had quite a bit since about 1991. We’ve had several plans as well. Peg McNichol: And what is it that you think you’ve accomplished by having this plan for people living in the state who live with various disabilities? What is the value, or the benefit, of having a plan? Rodney Craig: The benefit of having a plan is that each of the Centers for Independent LIving in Michigan utilize that plan to build the work that they do in their individual communities. 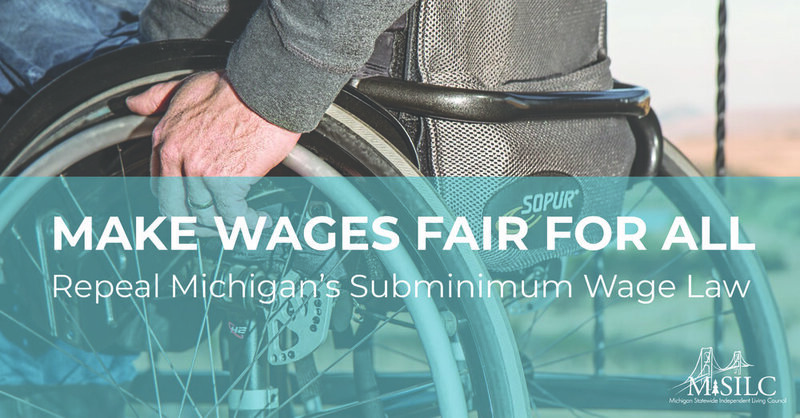 It allows them to have a statewide picture of how Independent Living Services are being performed in the State of Michigan. And then be able to report back to the governor’s office, or others, on the current status of the programs. It’s a really exciting time for Independent Living because there’s been a lot of changes at the federal level that are going to make this plan much more impactful and powerful. There’s a lot more consumer control and information coming into this plan that there has been in the past. Peg McNichol: I know just last year there was a huge celebration about the 25th Anniversary of the Americans with Disabilities Act. I know that’s made some changes for people, but there are still some significant obstacles that people with disabilities face on a day-to-day basis. Can you talk a little bit about the next big innovation that needs to happen to further independence for people with disabilities? Rodney Craig: I think there’s a lot of things that could happen. I think one of the primary things that we would advocate for is the full implementation of the current Americans with Disabilities Act that we do have. For example, our capital building in Lansing, which is the height of state government, still is not what we would consider an accessible building. So we have a lot of work to do to implement the ADA that we already have. There are a lot of things in technology with websites that do not have accessibility, websites get designed without accessibility in mind. So we have a lot of ground that we need to cover still. Progress has been made but as I said when certain individuals with disabilities cannot even access the state capital, we feel there is a long way to go yet. Peg McNichol: That’s a huge challenge for designers to understand that someone may be able to get online, but if they’re visually impaired they might need a reader or if they have other issues. For instance, if they’re hearing impaired they might need a video to be captioned. What are some of the other things people can do to their websites to make them more accessible to people with disabilities? Rodney Craig: Actually, one of the biggest things, and one of the difficulties we have with state websites, is almost exclusively any documents that you would download via an application to a program or information or meeting minutes where you’re trying to review those is they come in what’s called a PDF format, like what you’d see in Adobe. THose are very rarely readable by screen readers. The newer screen readers are better but they’re not perfect. So a lot of times even the state websites, as you were saying, do not have the ability to even get forms and things in an accessible format. We would very much advocate that those become text format, which are readable by screen readers and so forth. As well as you spoke about closed caption, there are some technological advances that have helped with closed captioning, but they have a long way to go. Things like YouTube and things like that have built in closed captioning. But it still has a long way to go as far as accuracy and things as to what is being said on the screen. Peg McNichol: Are there any particular areas of independent living that you’re specifically honing in on that you need to hear about from people? Rodney Craig: We would like for this to be an open discussion. We haven’t tried to hone in on any specific area because we want to remain open to what the consumers in that region of the state want to tell us. So we don’t want to try and direct their conversation. We want to hear from them as to what they are experiencing in that community and develop the plan based on their voice. Peg McNichol: If someone can’t make it to the library because they have a transportation issue, or their homebound for some other reason, how can they connect? Is there going to be a phone line? SHould they e-mail, or write a letter? How can they give you guys feedback if they cannot be present? Rodney Craig: Oh thank you, yes. We have several ways that we would love to hear from you. On our website at www.misilc.org, we have a survey that anybody can fill out - that’s to put information. If you have any trouble with that survey you can contact the office at 517-371-4872 and staff will assist you with that. You can email our office at any time - off our website there’s a contact section. Or you can email myself at rodney@misilc.org and you can email any comments, questions, or other information you have and we can get your input into the plan through those methods. Peg McNichol: What’s the deadline for the listening tour? When does it wrap-up? Rodney Craig: The tour itself would wrap-up on the date of the event, which is scheduled for February 10th. Right now on Wednesday, February 10th. That’ll be that date. We also have a Statewide Independent Living Council business meeting which will be on February 12th, which is where we will present the council with the information that we learned at the event. And then on our website at misilc.org we’ll be listing the next listening tour event for anybody else interested in coming to that event as well. Peg McNichol: When does the plan have to be finalized? Rodney Craig: Our plan has to be finalized and submitted by May 30th of this year 2016. We currently do have a draft version of the plan available on our website. But as I said that is a draft plan and it is still in the working phase. Around May, early May, we don’t have an exact date yet, but around early May we will have a public event in Lansing for people to comment on the draft bill, as well as, the final draft bill. That will be submitted to the Administration on Community Living in Washington, DC. for federal approval of the plan on June 1st of 2016. Peg McNichol: Is there anything I did ask you Rodney that you want people to know? Rodney Craig: No. I very much appreciate you taking the time to speak with us. We are excited to hear from this community. We’re excited to hear from all the communities. I believe that the information that we’re getting is vital in building a consumer controlled state plan for the State of Michigan. Peg McNichol: I really appreciate you taking the time with me. I hope you have a great day, and I hope you get a huge turnout for this listening tour. Rodney Craig: Well thank you. Again, anybody that has any questions can reach us by the website at misilc.org, or 517-371-4872 is our office phone.